Hi, Everyone! 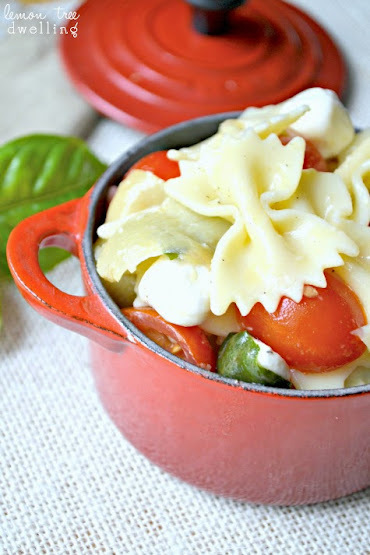 It’s Cathy from Lemon Tree Dwelling, back with another delicious idea to share with you today: my Caprese Artichoke Pasta Salad! This salad combines the delicious flavors of fresh mozzarella, tomatoes, basil, and artichoke hearts in a light, tangy homemade Basil Vinaigrette. The perfect dish for your next summer cookout! A good friend said to me recently that we’re lucky to live in the Midwest, where the weather is always changing, because it keeps us grateful. So true!! There is nothing we Midwesterners appreciate more than a good summer cookout, because we can only have them 3 months out of the year! I have a long list of cookout favorites – grilled chicken, corn on the cob, potato wedges, deviled eggs – but every now and then I am looking to mix things up! 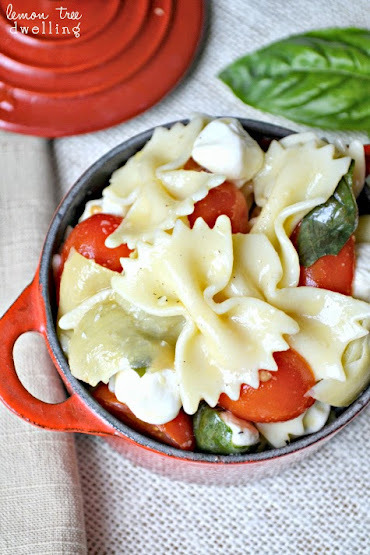 This Caprese Artichoke Pasta Salad may have just become my new favorite go-to salad. It is fresh, light, and summery, and I love the fact that it uses vegetables I have growing in my garden (when you’re from the Midwest, that’s a real treat!) Tomatoes, basil, and fresh mozzarella are always a winning combination, and the addition of artichoke hearts and fresh basil vinaigrette makes it that much better. 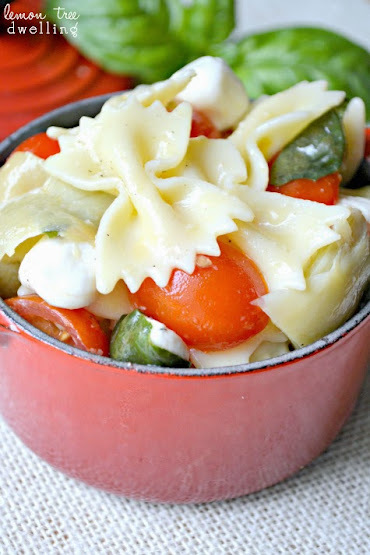 A new favorite at our summer cookouts, and sure to be a favorite at yours, too! If you like this recipe, be sure to check out some of my other delicious summer sides: World’s Best Cream Corn and Berrylicious Summer Salad! So happy I could be here with you today, and I hope to see you at my Lemon Tree Dwelling soon! Yummy! I love all those ingredients, and put together, I can only imagine the deliciousness! Thanks for the recipe. Thanks, Rebecca! It’s a great summer salad – light and refreshing! !